Although the Pilots have won their recent games, there are some concerns cropping up. We've commented on Alec's playing time and potential tired legs. But this last game, a problem often seen with Rev's teams came back, and that is extended scoring droughts. Yesterday, there was a 6 minutes period in the first half, and a 5 minutes period in the second half where the Pilots failed to score. Since the Beavers were offensively challenged, it wasn't fatal, but it will be against better teams. We also saw a late game strategy of running clock. Coach Porter stands on the sideline, holding Alec back near mid-court, and gives the signal to start the offense when he judges to clock is run down enough. So far it is working, mainly because Alec is so good driving into the key and finishing. And it has the effect of giving the players a little rest during the run of play. But I grew up watching Pilot teams try to nurse small leads by stalling out games, and it was often a failing strategy. They can't catch you if you keep scoring. 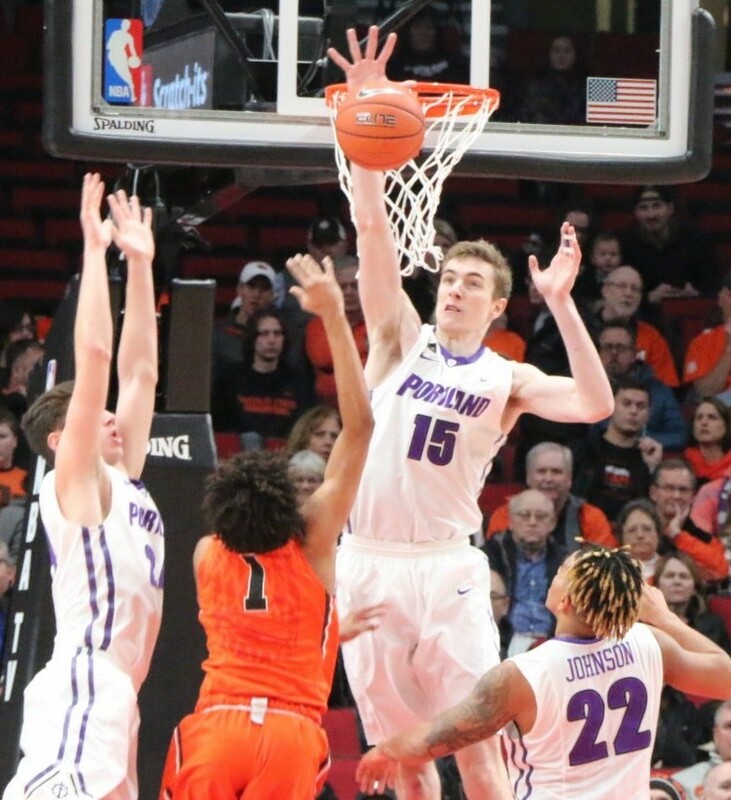 Against OSU, the main factors leading to the Pilots' low scoring output appear to be a bad shooting percentage and a very bad turnover rate. The three players contributing to the bad shooting percentage were Wintering, Johnson and Tyson. We've come to expect streaky shooting from Tyson, but Wintering and Johnson shot well below their season averages. Perhaps a result of fatigue? Perhaps they are both being forced to take too many shots, because there aren't other good options? I'd like to see Taylor get more shots, and Wintering and Johnson take fewer. The turnovers have been largely of Wintering's making. I'm not sure that there's any easy fix there. OSU while not very good this year still have Pac12 talent. They did a great job disrupting our guys and closing out on shooters. I don't think there is anything to worry about yet. That said, I still think Wintering needs to reduce his minutes. blacksheep wrote: OSU while not very good this year still have Pac12 talent. They did a great job disrupting our guys and closing out on shooters. I don't think there is anything to worry about yet. In his pregame talk before Sunday’s Moda Center matchup with Oregon State, University of Portland coach Terry Porter laid it out for his players. After the Pilots’ 53-45 victory, their mitts must have looked like those of miners. Floor burns, rebounds and defense were the bywords as Portland bounced the Beavers for the first time since 2005. “It’s early,” Porter said. “If someone had told me we’d be 7-3 at this point, I’d have taken it, no doubt. Considering our schedule. The other Portland paper has an article about a team from down the valley suffering another defeat. Geezaldinho wrote: The other Portland paper has an article about a team from down the valley suffering another defeat. That headline did not make me happy, to say the least. Getting some more Ws under our belt will force the O to actually pay attention. Could be worse. The Corvalis paper is in complete denial with no mention whatever of the result - not even a box score. Nice articles on the women's team, though. Even the Eugene paper had an article, though it was about the Pac-12 team struggling. And they had full coverage of the Zags win over Tennessee. Mark Few was eloquent. Cheers to the Register-Guard on that headline, proving they understand what kind of Pilots we are, and taking full advantage of the metaphorical opportunities presented therein.